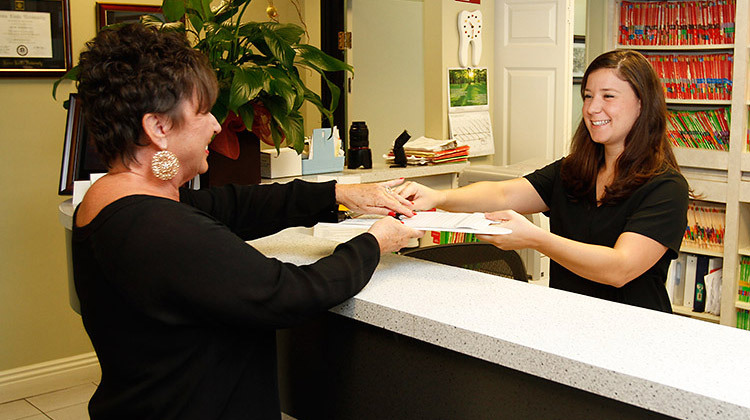 You’ll always receive a warm welcome when you visit our practice. We will review your dental and medical history, and discuss your goals for your oral health and smile with you. High-resolution digital X-rays provide our doctors with valuable information about the health of your teeth and gums. Digital X-rays emit 80% less radiation than traditional film X-rays and provide detailed, crisp images. They allow our doctors to detect any issues with your teeth and gums that can’t always be observed during a visual examination, such as decay beneath a filling, bone loss, infections or abscesses in a root canal and abnormal growths. Our doctors use intraoral cameras that transmit images of the inside of your mouth to a monitor, allowing you to see exactly what your doctor sees while he performs his examination. Your doctor will evaluate your mouth on a tooth-by-tooth basis, checking for signs of decay, abnormal wear or erosion, and for gaps between your teeth where food may get trapped and lead to decay and gum disease. He will also check your jaw joints for any abnormalities in their functioning. Periodontal disease has been linked to heart disease and strokes, making the health of your gums as important as the health of your teeth. Your doctor will gently probe the space between your teeth and gums to determine if there are signs of gum disease. When disease is present, gums pull away from teeth, leaving “pockets.” Deeper pockets are signs of more severe gum disease. We also evaluate your existing bone structure and assess factors that influence the predisposition for gum disease, including chronic inflammatory diseases such as diabetes and habits such as smoking. Although oral cancer is rare, we like to err on the side of caution and conduct a thorough screening during all examinations. If anything looks suspicious, we take a swab or biopsy and send it to our state-of-the-art lab for analysis. After your examination, your doctor will discuss his findings with you and provide you with a custom treatment plan that outlines the procedures that best fit your individual needs. As always, he will explain his recommendations in detail in terms that you can understand, and he will answer any questions you may have.